From 35000 feet up in the air a view of winter taking grip of the US. photo this snowmelt water is captured for irrigation. Ms. Young also captures this cycle quite here...(at a previous photo of the day). 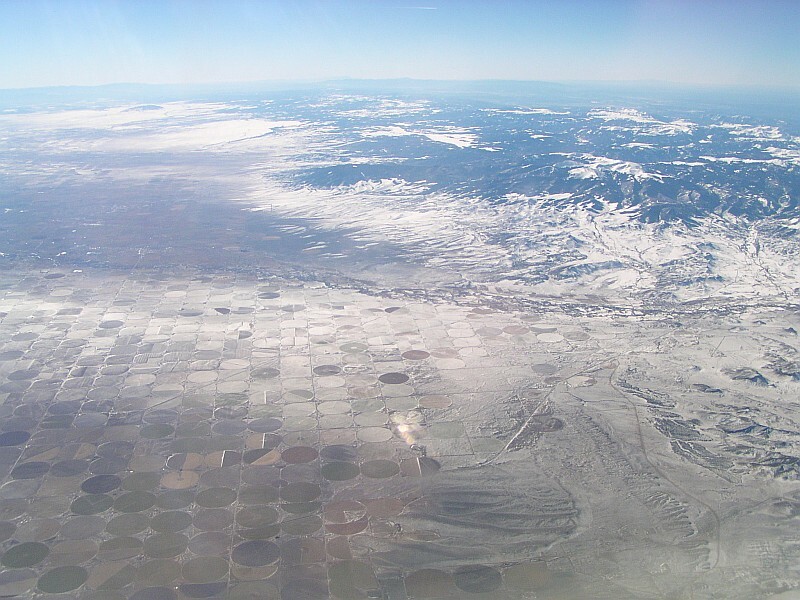 Yeah Selvin, do you have any idea _where_ over the western us you took the photo? From the looks of it, it was Kansas or Neb. nice shot!!!! i'm clueless to what all round dots are. anyone know what they are? Yes, they are watered fields using circular irrigation systems. A few are still green but that will change soon as the winter snow arrives. McCleod, I wish I knew the exact location but it was taken during a trip from Chicago to Hawaii. This direct flight takes a route over the mainland that exits the continent around San Francisco. Digcamfan, your comments always a joy to read because of their deep manings. Very nice photo, but at 35000 feet up it would be must colder. -50 F degrees.